Not too late at all. I'm sending the specs (big fat thanks to Bushy and Spanner for their insights and expertise) on Monday. After we pin down what they can and can't do, and finalize the price, i'll post up for final commitments and how to pay. Then we are rolling. I'm anticipating placing the order and delivering payment by the end of this week. I'll keep the board posted. Yep, this thing in ON!! I can't take it anymore.. I really miss my bike. I'd like one piston please. I think I read above that no case machining is neccesary. That's the goal. No machining, just sleeves and piston to fit OEM rod for the 628 crank. Augh ... I want one just to be able to build one in the future, but don't have the cash. When is full payment due? At the start I assume, or? Stay tuned, I may be buying an extra or 2 subject to the reply from Wiseco. Thanks for speaking to me a couple of weeks ago about the custom pistons for my group’s Husaberg 650 project. I’ve discussed the types of pistons we believe would best suit our needs and, of course, would appreciate your insights as well. Below are the specifications we would like to see with regard to our order. As it stands right now, we wish to order 12 custom pistons [pending the price, I may be able to order more]. Please send me some estimates of the price per piston without any coatings and with the skirt coating. We’d like to have a piston final sized to run in an Iron liner with a finished diameter of 4.125" = 104.775. The engines are liquid cooled about 690cc (after oversized piston and sleeve) with compression ratio up to 12.5 to one and 70-75 rwhp. If we use just over a thou per inch of bore diameter the clearance can be 4.2-4.4 thou giving a piston diameter of 104.665mm. Thus, in practical terms 104.67mm but we would like your opinion on the clearance. Piston total volume, minus 13.9cc. For rod clearance see attached pdf drawing of the “628" rod. However, we believe the skirt on the Prox piston is too narrow and would like a wider stronger skirt like the oem Wossner and Elko/Mahle Husaberg pistons or the jbs “105mm”. 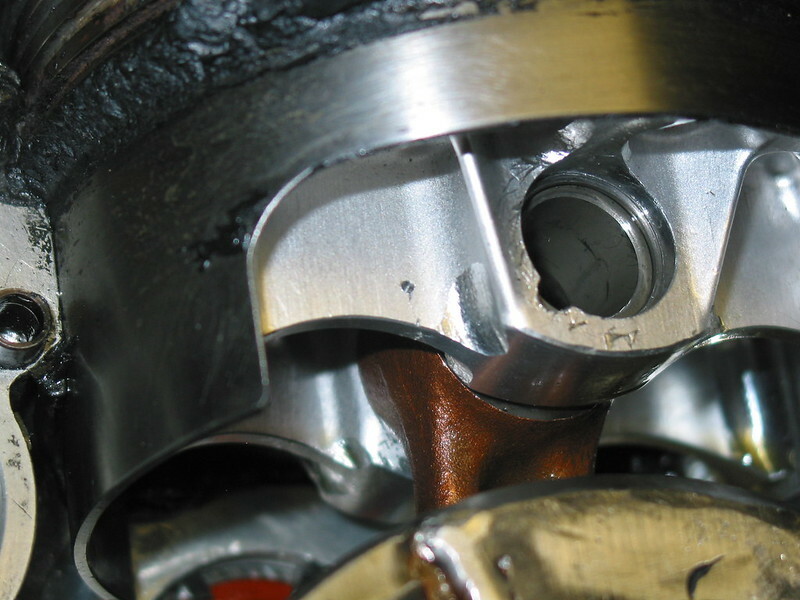 The Ringset can be your 4127GF but used on the piston with one compression and one oil Ringset only. Here is a link to the discussion amongst the group. “Bushmechanic” and "Spanner" are by far the most knowledgeable on the topic and I'll likely consult both of them with any questions. While I'd like to pretend to understand all this, I'm at best a hamfisted shade-tree wrench that is grateful to others much more knowledgeable than myself. Spanner has asked if it is possible for us to ask for some of the pistons (one or 2) machined but without the top being done. Is that a possibility? We also would like to know the estimated minimum weight of the pistons and if they can be made lighter than about 320gm (piston only). Additionally, do you have a taper bore20mm piston pin available? For example, the Wossner 20mm pin is taper bore at 66gm and the Mahle at 70gm, a solid pin is about 80gm. Please let me know asap if the 104.665 mm piston is doable as we are also arranging an increased capacity “sleeve” order. Thank you for your time and consideration. If you have any questions, feel free to contact me at kgquist@gmail.com I’ll do my best to answer, however, I’ll likely have to consult briefly with others who are much more knowledgeable than I am regarding specs. Quick update: Just got off phone with Wiseco. Specs received and Al's on it! He's a good guy. As an aside, he's strenuously urging skirt coating and armor top coating due to compression and the results from their in-house testing. Still, we agreed to hold that discussion until the remainder of the project is vetted. Stay tuned! If you help me find 08 Fe650, then I would take three. I just started looking for one. Need help finding one. I want 2008. Did he say How much do the skirt and top coatings add to the price ? Last edited by bushmechanic; March 25th, 2016 at 04:56 AM. Stupid question. Will these fit in the 644 motor or just the 628's?